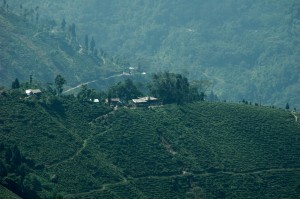 The Makaibari Tea Estate is in Darjeeling, India and lies at 1300m above sea level in the foothills of the Himalayas. The estate covers six ridges and on a clear day you can glimpse the plains below. Within its boundaries are seven villages where the 800 estate workers and their families live. Though the estate is around 670 hectares, only 270 hectares are turned over to the growing of tea. 120 hectares of the estate have been conserved as rainforest and protect a diverse range of wildlife and rare plants. Founded in 1859, Makaibari is one of the oldest estates in Darjeeling. In 2014 90% of the business was acquired by the Luxmi Group, who manage estates in Assam and Tripura. However Rajah Bannerjee, a pioneer of the organic and biodynamic movement in India, will continue to run the estate on a day to day basis. Over the last 30 years he has developed a successful and highly regarded tea estate. Makaibari was the first organic and biodynamic certified tea estate in India, Indeed sustainable agriculture and environmental welfare are at the heart of the Makaibari ethos. 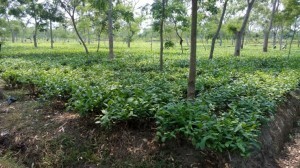 The Jamguri Tea Estate in Assam is part of the Ambootia Tea Group. 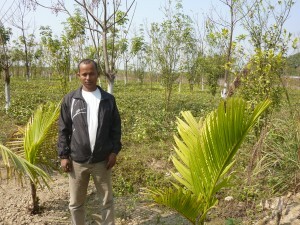 Jamguri is the company’s only estate in Assam, whilst they run several estates in Darjeeling. These are all organic certified, whilst several offer teas under the Fairtrade scheme. James was made very welcome at Jamguri as well as on his visit to Ambootia and Moondakotee in Darjeeling. Jamguri is situated in the Golaghat district of central Assam and is approximately 40kms south of the River Brahmaputra that runs the length of Assam. When James visited the estate it was prior to the growing season, but was still extremely busy in preparation. Each year, between seasons, alongside pruning the tea bushes the planting of new saplings takes place – they were hoping to plant up over 100 new acres in the next few years. 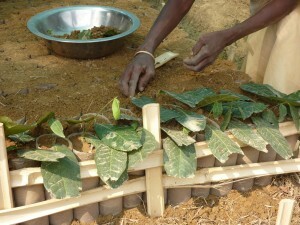 Meanwhile in the large nursery new cuttings were being potted up. Within the bounds of Jamguri, common to estates around India, there are several villages where staff and their families live and the children attend state run schools. Amongst other things, the company provides housing, cooking fuel and basic medical treatments. Every child is entitled to free primary school education and scholarships for further training are available. The Greenfield Estate, where our English Breakfast and Earl Grey come from, is within the Uva Highlands of southern Sri Lanka; a region famous for tea growing. It covers an area of about 200 acres and reaches 1300 metres above sea level at its highest. There are about 190 people working on the estate and it has gained a reputation for creating really great quality tea. 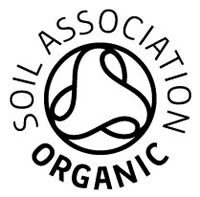 It is Fairtrade certified and rightly proud of its organic status and organic management. For those working and living on the estate, where no chemical fertilisers or insecticides are used, this allows for a safer working environment and ensures there is clean uncontaminated water. A rich diversity of native flora and fauna flourish around the estate with the improvement and quality of the soil being maintained through the use of manure, composts and vegetable matter. One of the schemes offered at Greenfield is that every family is provided with a cow; the manure it creates can be sold back for use on the estate, whilst also generating extra income for the family. The Kanoka Estate is situated on the edge of Panchnoi Village, north of the River Brahmaputra and west of Tejpur city in the Sonitpur district of central Assam. Established by Pallab Nath and his family over the last few years, they have created 22 acres of mixed crop with just 8 acres currently turned over to tea but with plans to extend. They also grow for the local market mangoes, bananas, oranges, coconuts as well as rubber. 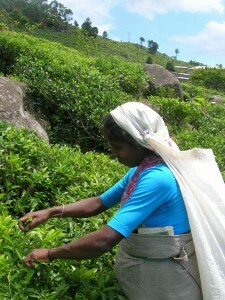 Pallab has been using organic practices from the beginning and Kanoka is fully certified in India. They have also begun to build up a network of fellow small tea growers to establish and promote these exclusive organic, handcrafted teas locally and for the International market. The Kanoka Estate is a beautiful, impressive and inspiring farm. We currently import our Bristol Breakfast from the Belseri Estate and like Kanoka (above) the estate is situated in the Sonitpur district of central Assam, on the northern bank of the Brahmaputra River. Growing tea on over a thousand acres Belseri is now probably the largest estate in Assam producing 100% organic teas. The estate converted to organic in 2005 and has been fully committed ever since. They also have plans for the whole estate to become a ‘chemical free zone’ with the establishment of a village where organic fruit and vegetables will be grown, benefiting those living in the plantation. The tea we have received from Belseri is wonderful – a true Assam with a smooth, deeply rich, malty character. At a time when changing weather patterns threaten to impact on the quality and future of Assam tea Belseri is creating a really special product.